Put the Wild in Wilderness. The Arctic National Wildlife Refuge. The Arctic National Wildlife Refuge, or ANWR. 19 million acres of wonder. On this trip we spend nearly 2 weeks in the Refuge, rafting and hiking from the Upper Marsh Fork of the Canning River all the way north across the coastal plain, down the Staines River, to the Beaufort Sea. From deep in the Brooks Range near the Continental Divide to the Arctic Ocean. Wolves, arctic and red foxes, black and grizzly bear also roam the tundra. In ANWR, even seeing Musk Ox is a possibility. The Arctic National Wildlife Refuge, and the Canning River area in particular, is known for it’s amazing bird life, and there are numerous species of birds in the region, including golden eagle, Rough-legged hawks, Gyr and Peregrine falcon, ptarmigan, tundra swan, arctic terns, gulls, loons, magpies, and an amazing diversity of ducks and geese. As we approach the arctic ocean we’ll visit the marsh ponds where many of these birds are found nesting, and might easily be photographed (ensuring we’re careful not to disturb them). Rafting is definitely the best option for travel in Arctic National Wildlife Refuge. it’s faster, easier, and a nice break from carrying all that heavy gear on your back. This ANWR trip affords a great variety of terrains, from the mountains of the Brooks Range, the rolling foothills of the North Slope, and the coastal plain, host to an incredible diversity of wildlife, vegetation and birds. There is a very good possibility of encountering the migrating Central Arctic herd, numbering in the tens of thousands, as they move westward across their summer range in the Refuge. We’ll be sure to allow plenty of time for day hikes and exploring, particularly in the earlier part of the trip in the Brooks Range. The Arctic National Wildlife Refuge is so little visited that we’ll likely be walking in valleys and on ridges that are rarely travelled by man. Few people leave the wide braided river beds of the valley floors. It’s well worth the effort to climb the ridges and peaks for some stunning views or just to sit and wile away an afternoon. Soak up that ANWR wild. It would be remiss not to mention mosquitoes regarding this trip. The arctic is famous for mosquitoes, and yes, they really can be that bad. But, with proper attire, mosquito repellent, bug netting, and a good attitude, it’s possible to not have too many problems. Here again the river is your friend, as the wide braided channels of the stream provide little habitat for the mosquitoes, so they’re found in far fewer numbers along the riverbed. Also, a nice breeze is often blowing up the riverbed, which helps keep them at bay. Trip Highlights ANWR, Float 3 rivers, the Brooks Mountain Range to the Arctic ocean, wildlife viewing, dayhikes, photography, wilderness. Trip Options Typically float thru ANWR to the coast, with dayhikes along the way. Also can do a shorter float trip, or a basecamp and dayhike. Backpacking option available. Packrafting trip option available. Similar Trips Sea kayak Icy Bay, basecamp or backpack ANWR. A free download, with info, photos, logistics details and more for our Canning River Rafting trip in the Arctic National Wildlife Refuge. Enjoy! Questions? Comments? Leave 'em here! Signup to be notified of all ebooks, newsletters and all the goodies as soon as they hit the streets! Just an update a couple times a year would be nice. On a scale of 1 – 5, five being the most challenging, three hiking boots is smack in the middle. 5 boots = ask yourself are you really ready for this? Expect whatever level you think might best fit you to be one level LOWER on our scale. Hiking here in Alaska is generally a step or three above what you’ll find in the Lower 48 states. If you consider yourself up for an intermediate level hike, for example, assume that a trip rated intermediate here will probably be a bit tougher than you’re expecting; not impossible, but harder than you think. Intermediate level trips don’t mean you won’t be challenged, won’t struggle at times, and won’t have any easy sections either. On any trip you’ll probably find some easy sections, some harder, and some are challenging. Also, understand that all these rating are so completely subjective that they’re not entirely all together practical. They’re a VERY loose idea of how the trips might compare to one another, for some people. Lastly, understand that even a trip we might rate as “intermediate” (3-4 hiking boots) may still have some difficulty at times. Weather changes things. There may be a tough steep climb on the route that takes a few hours. We’ll meet in Fairbanks and travel north up the Dalton highway to Coldfoot, at the beginning of the Brooks Range. Spend the night in Coldfoot before flying in a chartered air taxi the following morning to our landing strip on the headwaters of the upper Marsh Fork River. From here we raft the Marsh Fork to the Canning, down the Canning and on to the coastal plain where we join the Staines River (pronounced Steens) and float to the Arctic Ocean. On our pickup date we fly back to Coldfoot where we’ll enjoy hot food, a shower and a relaxing evening before the drive back to Fairbanks the following day. This trip is somewhat flexible. We can do a 7 day trip or a 14 day trip. We float all the way from headwaters to the sea or shorten it on either end. The actual paddle from top to bottom is a good 7-8 days floating time. Spend 12 days and take time for day hikes and explorations and photography along the way. Packrafting option is available if you’d rather. This works well for a shorter trip, and/or a combination backpacking/packrafting route. Inquire for details. “Rafted with Expeditions Alaska 7/8/13 to 7/21/13 in the Arctic National Wildlife Refuge. Carl Donohue (Owner/Guide) is a great guide and host. He was knowledgeable and well prepared. 13 days in Alaska’s most remote wilderness without any glitches. Carl offers a variety of guided trips all of which are quite unique. Carl’s trips are for the true outdoors person. I will go with Carl again hopefully fall of 2014.” – Trumen B, California. Generally mild Class I and II water. Some sections of Marsh Fork can run swift, and at high water, a low Class III is possible. Most of the Canning is slow moving calm flat water. The biggest challenges paddling are the lower water in the Upper Marsh Fork and the lower Canning River. It’s not uncommon to encounter strong onshore headwinds out of the arctic that can also make the paddling harder out on the coastal plain. It’s not technical paddling, but making headway against strong winds is hard work. See more images, information and details about this trip. Grab a free Trip Information eBook. Click on the map to interact and zoom or open map in new page. I can’t over-emphasize that this itinerary is simply an example. What I work hardest on is tailoring trips to the specific interests and abilities and experience of the people who hike with us. No two trips are the same; where possible, we don’t use the same campsites when we do the same route, we often even vary the route when we can. Mostly, I try to be flexible with how far we hike each day, how many days we spend in the backcountry. What time we get up in the morning, for example, is largely up to the trip participants (unless for some reason I feel we need to be up and on the trail by a particular time – this rarely happens). The Canning River, ANWR rafting trip is a blast. Like all the trips we run, the itinerary is somewhat fluid. Weather, hiker experience and many other factors determine the actual trip. For simplicity sake, I’ll assume the trip dates are July 1 – 13. Realize everything here is simply an example. It’s possible to complete this trip in less time, or easily spend more time en route too. I feel a 13 day trip is about perfect for this route – this gives you 10 complete days in the backcountry. Trip participants should arrive in Fairbanks no later than the evening before our schedule trip departure date. For our example, the Trip would require all participants arrive in Anchorage sometime on June 30. I highly recommend you try to arrive even a day earlier is at all possible, to allow for flight delays resulting from weather. Expeditions Alaska does not provide, but can recommend, accommodation in Fairbanks. I will meet you in Fairbanks). We’ll travel to Coldfoot and from there fly in to the Marsh Fork of the Canning River. This flight brings us over the Brooks Range, and the Continental Divide to the landing strip on the Upper Marsh Fork River. We’ll get dropped off by the pilot, and haul our gear over from the landing strip to the River. Depending on what time we get in, we may camp by the river and spend a day hiking in the mountains nearby. We’ll load the rafts and head down the River. Here the water level is often low, and we may have to haul the rafts sometimes. Usually we don’t have to go far, as we should find deep enough water reasonably quickly. It’s a good idea to pack some sandals for this section of the trip, and some kind of wading pant (see your gear list). If it’s warm, just wear shorts. The water’s cold, but not unbearable. How far we go will depend mostly on water levels, and they can fluctuate week to week up here. Either way we’ll camp by the river – usually I try to camp on the riverbed, as the rocky gravel bars provide some escape from the mosquitoes that live up in the tundra. Bring a good sleeping pad. We’ll probably start out with a hike up onto some ridges and peaks, and get a feel for where we are. Down in the riverbed the traveling is easier, but it shelters you from an understanding of the place you’re traveling through. The views from some of the high peaks nearby are simply amazing and sure to have you snapping some pictures. Then we’ll hike back to camp, have some lunch, pack up, and raft down river a few miles. We keep rafting down the river, and should reach the confluence of the Canning and Marsh Fork River today. This is a great spot to camp, with an incredible broad open valley that runs due north, some really interesting mountain and rock formations, and a good chance of seeing wildlife – wolves, moose, bears, caribou, and birds like arctic terns and golden eagles in the area. We might do a short walk up the Canning river valley this afternoon after setting up camp. We make some miles down the river. Once we join the Canning River, we’ll pick up good water, and should travel much faster. We’ll raft down river, past the island. We run the canyon, a small narrow cleft between an escarpment the river has cut through. It’s really an interesting place. Also, keep an eye out for Dall sheep that live and travel through the area. As we start to reach the northern edge of the Brooks Range, we enter the foothills and the open tundra of the coastal plain. The terrain changes sharply, and we’ll try to take advantage of the open land here and do some walking after the day on the river. We should also paddle by a rough-legged hawk’s nest (or 2), getting a great opportunity to see these birds. The landscape flattens out, and we start to enter the coastal plain. Wolves and foxes are seen around here, so hopefully we’ll get to see them. We will spend this day rafting out to the ocean. We can camp right by the sea, within site of the polar icecap just off-shore. We’ll walk the tundra and look for caribou, arctic and red foxes, and birds like snowy owls, tundra swans, and a myriad of waterfowl and shorebirds. We can paddle or hike back up to a birdcamp, and photograph an amazing assortment of birds that live in the ponds and lakes here- loons, ducks, mergansers, swans and more. We get picked up, flown to Coldfoot, and stay the night there. We then travel back to Fairbanks. Download the Trip Info Packet on this page for more info. Upon your reservation you’ll receive a detailed trip departure packet that has a comprehensive gear section in it. You’ll need your person clothing, sleeping bag and pad, camera gear, etc. Expeditions Alaska can provide paddle gear (PFD, dry pants, splash jacket, booties, etc), all rafting equipment, tents, cook tent, etc. Most years? It’s as buggy as you’ve heard it might be. It does vary a lot year to year, but typically, this trip is pretty thick with mosquitoes. So bring your repellent, a headnet and a healthy dose of tolerance. We provide a large cook shelter for the kitchen, and this helps a lot. On the river itself, paddling, bugs generally aren’t too terrible. Out on the tundra, if there’s no wind at all, it can be about as thick with mosquitoes as you can imagine. I like to run this trip 1 guide and 3 guests per raft. Some years that means 2 rafts and 6 guests and 2 guides. Most years it’ll be one raft and 3 guests. Will We See The Great Caribou Herds? I try to schedule this trip in such a way that we optimize our chances. But caribou migrations are erratic. They don’t follow consistent timelines or even consistent routes. Some years they move together in a larger single herd, other years they disband and move as many smaller groups. So in short, maybe. You should see “some” caribou but it’s impossible to try to say yes or no regarding the larger herd migration. We do our best. Excellent. And the closer to the coast we get, the better the birding is. Birders, inquire about a list of birds we might typically see. Do We Need Previous Rafting Experience? With any river trip it’s advisable that you’re at least comfortable in the water. We’ve never had anyone come out of a boat at all, but accidents can happen. The more comfortable and less panicky you are in water the better we’ll able to help you in such a situation. What Do We Need To Know About Safety Stuff? Your guide will go through a comprehensive safety talk with you at the start of the trip. This includes river and boating safety, safe travel in bear country, basic backcountry etiquettes and safety notes, Leave No Trace practices, some elementary navigation practices, etc. We provide a satellite phone and a backup emergency messaging device such as a PLB or deLorme Inreach, and a comprehensive first aid kit. We also provide bear spray and bear resistance food canisters for safe travel in bear country. What’s Included – ANWR trips? All multi-day trips (backpacking, basecamping, packrafting, photo tours) out of Fairbanks include transport to/from Fairbanks/Coldfoot*, 1 night accommodations in Coldfoot, air taxi flights Coldfoot/The Backcountry, group gear such as tents, cook tents and bug screen kitchen, stoves, fuel, BRFCs, bear spray, etc. Hiking poles are included (optional) if you don’t have your own. We include a satellite phone for emergencies and one backup emergency contact device, such as PLB or Garmin InReach. First aid kits, map and compass included. All guides are Wilderness First Responder Certified. All your rafting equipment is included. Raft, paddles, dry bags, splash jacket and pants, neoprene booties, neoprene gloves, etc. We’ll provide you with a detailed gear list for your personal items upon your reservation. Storage of your overnight travel gear is limited but available (keep it simple, one small overnight bag). Expeditions Alaska can either fully outfit your trip (all food, etc) or adjust things a la carte if needed. Guide gratuities are not included but most appreciated. Trip insurance is not included but I urge you to purchase it on your own. I know you do. I do as well. More questions? Email me or call me and we’ll go through them. Upon your reservation I’ll also send out a comprehensive trip information packet that covers just about everything and more you might imagine about your trip. Discover Icy Bay. World Class Kayaking. On a scale of 1 – 5, five being the most challenging, two hiking boots is at the easier end of the spectrum. Realize that backpacking is never “easy”. You’re carrying from 35-50+ pounds on your back day after day. You’ll be hiking for a number of hours each day (varies trip to trip, day to day), and that’s not “easy” for most people. That said, our “2 hiking boots” level should meet the need for most novice backpackers, and are generally what I recommend for families with younger kids, etc as well. Terrain challenges aren’t usually a problem, and the walking is somewhat more orthodox. You won’t be traversing 1 mile of steep sidehill covered in slippery rocks, or snaking through dense thickets of alder and willow. Beachside camping, spectacular scenery, gorgeous sea kayaking in a place National Geographic call of the Ten Treasures of the World. Access the Alpine. A Remarkable Arctic Adventure. On a scale of 1 – 5, five being the most challenging, five hiking boots is right up there. Expect it to be tougher than you think it will. At least in part, anyway. Some sections will inevitably be easier. Some will make you feel it. And he’s right. It does. Don’t be fooled by the low mileages and the lower elevations. The catch is the difficulty of traversing rugged country with no trails. However much you think that might impact you, double it. You need to be athletic, well balanced, in good shape, and an experienced backpacker for this kind of trip. If you’re not that .. well, don’t say you weren’t well warned. A backpacking adventure in a place like no other. 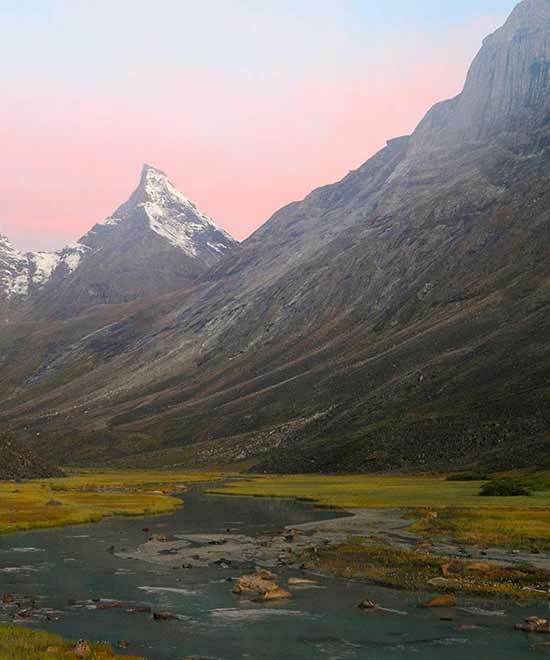 Hike the Brooks Range and camp beneath the soaring Arrigetch Peaks. And finish with a packraft adventure down the Alatna River.